So I have new contract and new job title. 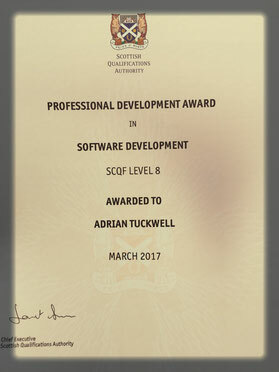 For the next 12 to 18 months I'm going to be a Web Developer for Aberdeen City council. Well chuffed. It makes my time at CodeClan a worthwhile leap of faith to change career from oil and gas into something less industry specific. Speaking of a leap of faith. I watched an interesting clip on YouTube this week describing the Tarzan method. It rang true to me on a number of levels. It seems to be what I have been doing over the last few months. Imagine you are Tarzan navigating your way through a jungle. Your destination is your dreams and aspirations. To get to your destination there is a mythical straight line through the jungle that would take you there. Because of the jungle trees and bushes it is not possible to go in a straight line. So as Tarzan would, you grab hold of the nearest vine and swing with all your might in whatever direction that vine will take you. Its not in the direction of your dreams and aspirations but it is just a little bit closer to your goal. You then grab hold of another vine and swing in another direction. This time again its not exactly where you want to go but it has moved you closer to your goal. The cool part of this is that grabbing hold of a vine with an open mind will take you to places that you would never have gone if you had planned it out on the straight line. And it is in those unknowns that you can discover what your dreams and aspirations really are. It is in the process of committing yourself 100% to what ever you are doing at that point in time that gives you the skills and experiences and knowledge to make it to your goal. For me it it started with redundancy last year. I had become stagnant in a job I had been in for over 20 years. I was forced into doing something about it. I was presented with a Vine to go to a Pace careers event at Robert Gordon's University. I grabbed hold and went for it. Another Vine was presented and I met with a career advisor and Business Gateway. Again I grabbed hold and swung. The suggestion was made to go to CodeClan, I grabbed hold and went for it and had the best time. More recently I have setup Udny Solutions and gained a job to create a website. Now my new vine has been the opportunity to become a full time web developer. So I am grabbing hold of this vine and will swing in whatever direction it takes me and will give it 100% as Tarzan would. 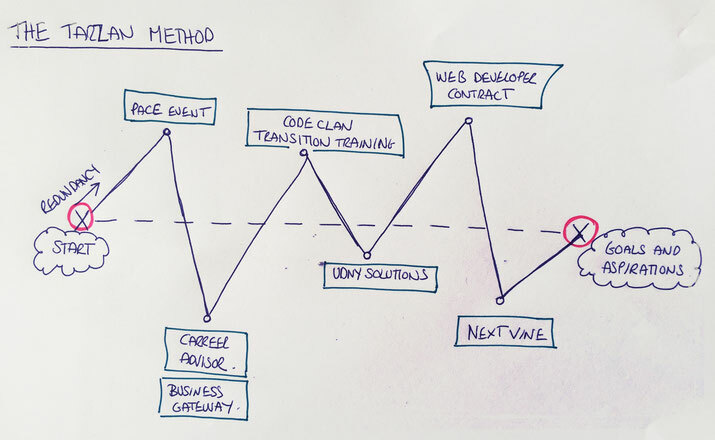 It will give me real world Web Development and Coding experience and gives me and Udny Solutions a boost forward. My contract starts in a couple of weeks and I am super excited about it, Im just waiting for the paperwork to come through. In the mean time I am busy with Udny Designs. Over the next couple of weeks I have been asked to do some simple woodworking classes with kids with additional needs. Myself and Jamie did a few last year and it was really fun. We made robot kits with all parts needed collected in individual little zip lock bags. Kids will open the bag sort the bits then have fun bashing them together with a wooden hammer. When finished they add colour with stickers and felt pens. We have 5 classes to do... Peterhead, Fraserburgh. Banff, Inverurie and Stonehaven. I have 50 kits to create. Lots of parts, 50 bodies, 50 heads, 100 legs, shoes etc. Its a lot of parts to cut, drill and sand. I'm looking forward to seeing what's created. So hopefully my Web Developer contract will arrive in the post this week. 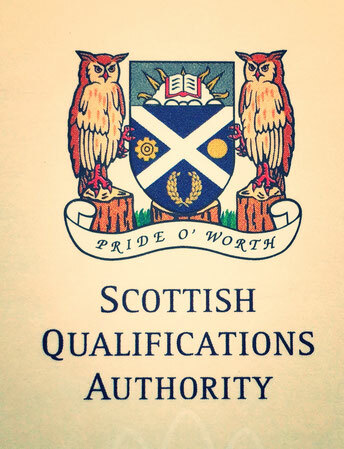 Something that did arrive in the post this week was my official certificate from the Scottish Qualification Authority for my Professional Development Award in Software Development. It came in a "please don't bend" envelope and on the finest paper with holograms. It will be pinned to the fridge for a couple of weeks before it gets filed away. Thanks for reading, and happy easter. Adrian love reading your blogs, that are brilliant. The Tarzan method resonates with my golf. It was a pleasure reading! !